Hormel Foods Corporation (NYSE: HRL), one of the nation’s largest manufacturers and marketers of consumer-branded meat and food products, has introduced Spammy™, a fortified, shelf-stable turkey spread to help address childhood malnutrition throughout the world. Spammy™ is a shelf-stable turkey spread that has been fortified with zinc, iron, B vitamins, and other essential vitamins and minerals. Hormel Foods has made an initial three-year commitment to deliver 1 million cans of Spammy™ to in-need families in Guatemala through partners Food For The Poor and Caritas Arquidiocesana in 2011. Guatemala was selected because its poverty rate is more than 50 percent and the chronic malnutrition rate is the highest in the Western hemisphere. Food For The Poor is a relief and development organization that raises funds and provides direct relief assistance to the poor in Latin America and the Caribbean, and Caritas Arquidiocesana is a charity committed to combating poverty. 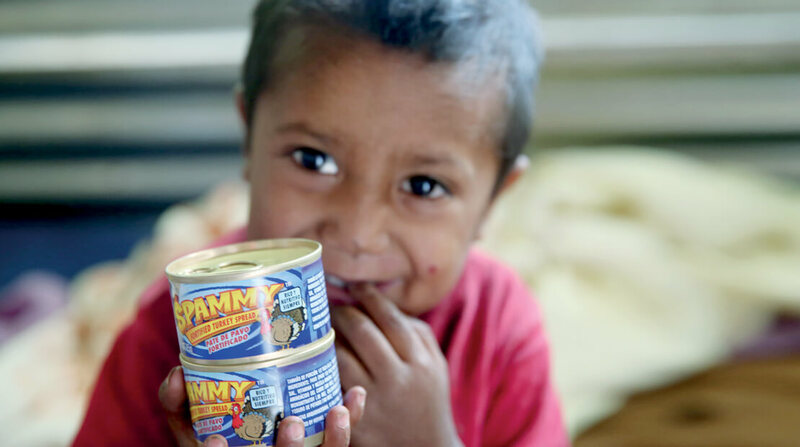 Hormel Foods has been distributing Spammy™ in Guatemala for about 18 months to family centers and orphanages. In addition, Hormel Foods worked with Food For The Poor and donated more than 100,000 cans of Spammy™ to Haiti after the earthquake in January 2010. Hormel Foods and Food For The Poor created a website to allow individuals to contribute to the Spammy™ program. All donations through the website will go directly and fully to Food For The Poor to purchase Spammy™ fortified turkey spread at cost from Hormel Foods. The product then will be shipped by Food For The Poor to Guatemala and distributed at the orphanages, day care centers, nutritional centers and family centers within the Caritas Arquidiocesana network. To make a donation or learn more about Spammy™ or Food For The Poor, please visit: https://www.hormelfoods.com/responsibility/hunger. Hormel Foods shows the way to meet environmental and economic goals Hormel Foods shows the way to meet environmental and economic goals. The Culinary Institute of America and Hormel Foods Expand Reach of Industry’s Only Top Chef Advanced Management Training Program The successful Culinary Enrichment and Innovation Program (CEIP) will welcome 16 new students to the program. Caritas Arquidiocesana serves the poor, the sick, and the abandoned in Guatemala.